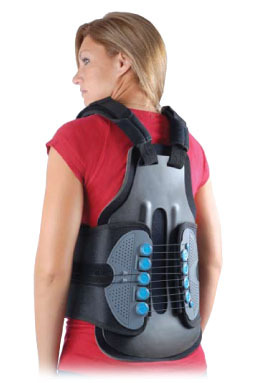 The Cyberspine Thoracal Lumbar Sacral Orthosis is designed to comfortably control and manage acute pain often associated with osteoporosis, compression fractures, spinal stenosis, strain, and excessive kyphosis. The CyberSpine TLSO provides superior triplanar motion control, extending from sacrococcygeal junction and terminating just inferior of the scapular spine. The four segmental rigid plastic shell components are ergonomically designed to restrict gross trunk motion in the sagittal, frontal and transverse planes. The anterior rigid plastic and thoracic extension extends from the symphysis pubis to the sternal notch. Overlapping plastic lateral panels provide lateral stabilizing strength and control. The patented mechanical advantage pulley system and abdominal compressive component allows the patient to actively participate in their therapy regimen resulting in comfort, control and enhanced compliance. Fabricated with a very soft plush removable inner liner. 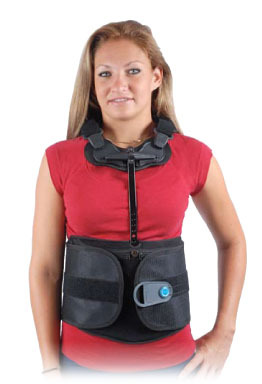 Easy, no tools adjustable linear thoracic adjustment and articulating sternal pad and padded shoulder straps. Locking screw below eliminates patient adjustment. Ergonomically designed posterior plastic frame with spine relief cutout extending from inferior spine of scapula to sacrococcygeal junction. Lateral plastic panels covered with spacer fabric for control and patient comfort. Item # Size Waist Circ. Back Pnl Ht.